Winter isn’t quite done with us yet! Through Thursday night and Friday frontal systems pushing Northwards across the country will run into a pool of colder air across the Midlands Northwards and we’ll begin to see things turning increasingly to snow. 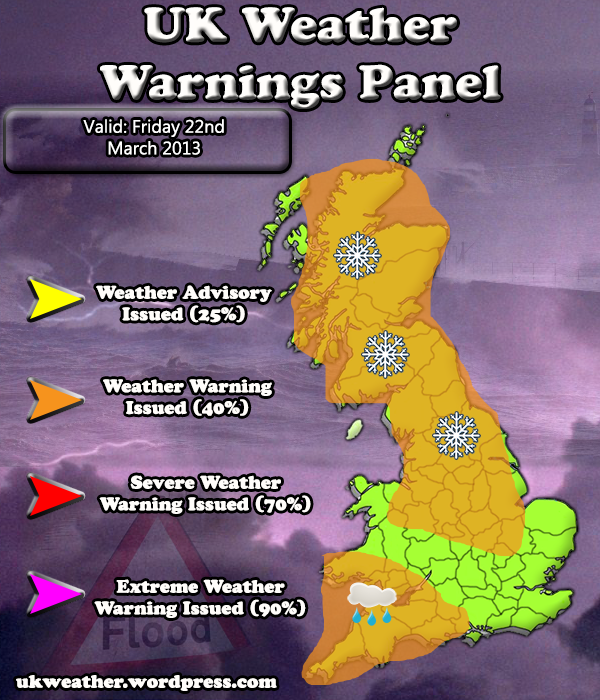 A widespread 1-5cm is expected but the North Midlands, Northern England and into Scotland could see a significantly larger amount. 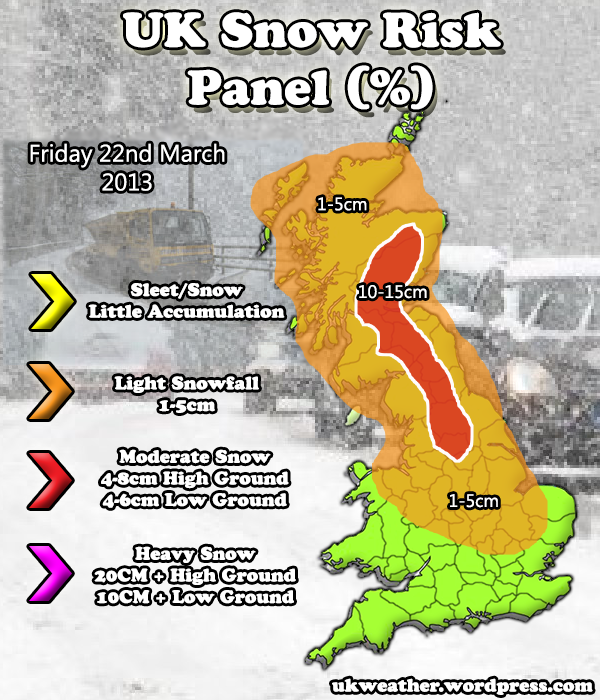 10-15cm looks likely to be the typical amount in these areas with localised areas seeing 20-25cm, the risk of blizzard conditions is a particular worry across the North Midlands during Friday. On top of that, areas further South are likely to see some disruption from this system too, not from snowfall but from rain. Locally we could see 20-25mm in a short space of time across more South-Western England and Southern parts of Wales, this is likely to lead to some flooding problems where ground is already saturated from recent heavy rainfall. I’m starting to get emotional about all this rain and Snow. A pretty accurate diagram! I left home this morning at 4am from Brigg, North Lincs and it was relatively warm with no ice on car but VERY windy and then by the time I got inland to Doncaster the snow was quite heavy, I then went south on the M18 and joined the M1 which by about 5am was thick with snow (which tallies with your red band in the pic above) but as I drove south on the M1 the snow diminished and by the time I hit the M42 by Birmingham it was little more than sleet. I’ve done the reverse trip tonight and again quite heavy snow on the M1 around chesterfield to Sheffield but NOTHING by the time I got back to Brigg. Mind you that was at 9pm, since then it has started to snow but only very light stuff.